Woodlawn is celebrating another successful year of serving area students in its popular Woodlawn School Program. According to Woodlawn’s executive director, Joshua Torrance, “We are thrilled to report that nearly1,000 students have participated in the Woodlawn School Program since January, and we have an additional 300 children scheduled for programs in December.” The program has served students from Ellsworth, Bar Harbor, Blue Hill, Dedham, Surry, Trenton, Steuben, Eastbrook, and the Outer Island Schools. Woodlawn’s signature program called Field Days, serves about 600 students annually. “Field Days offer a full day of curriculum for 7th and 8th graders in the Spring, and 5th and 6th graders in fall. 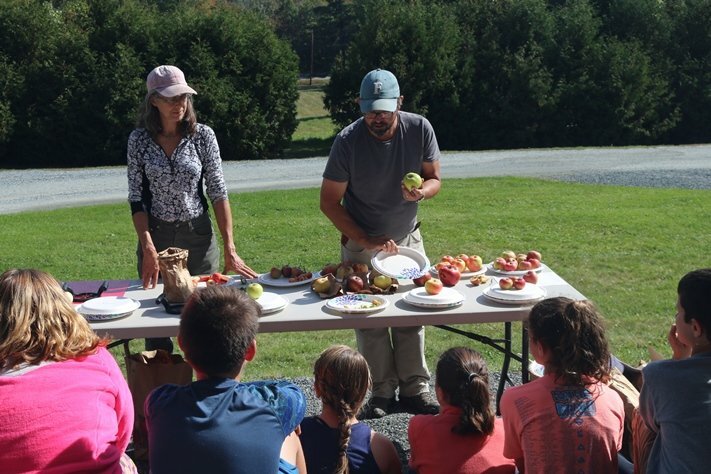 We work with partnering organizations to cover the multi-faceted curriculum.” Partners include The Jackson Laboratory, Seal Cove Auto Museum, Healthy Acadia, College of the Atlantic, Maine Center for Coastal Fisheries, Woodlawn Croquet Program, and UMaine Cooperative Extension Master Gardener Volunteers. Woodlawn School Programs are funded through a designated Woodlawn Education Fund which allows area school children to participate free of charge, including transportation. This fund is supported with proceeds from the Ellsworth Antiques Show held annually in August at Woodlawn. Torrance further noted that in addition to programming for students, Woodlawn also offers training for teachers through a biennial Woodlawn Teachers Institute. “The goal of the program is to bring teachers together to work as a team to develop curriculum-based programs utilizing Woodlawn’s history, environs, and collections.” The 2017 graduates were Ellsworth third grade teachers Lisa Backman and Torie LeBreton, and Ellsworth eighth grade teachers Kiersten Jester and Lori Johnston. They were selected through an application process and received 20 hours of training. “We often say the best days at Woodlawn are when the students visit. They are high energy days filled with laughter and learning.” For more information, visit woodlawnmuseum.org and watch the Woodlawn School Program video. Woodlawn is an educational, cultural, and recreational treasure for the people of Downeast Maine. The main house is open for tours May 1 – October 31 and December 1-23. The public park is open year round, sunrise to sunset. 19 Black House Drive (off of the Surry Road-Rt. 172), Ellsworth, ME. For more information, visit www.woodlawnmuseum.org.